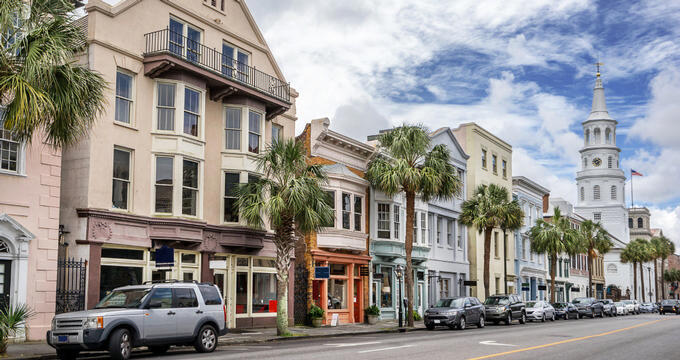 Charleston offers a wealth of excellent restaurants and eateries that serve traditional Southern-style fare and modern American cuisine. Head to The Gin Joint for artisanal cocktails and small plates, Lewis Barbeque for mouthwatering barbecue and smoked meats, or Chez Nous for French-inspired cuisine and wines in a cozy. 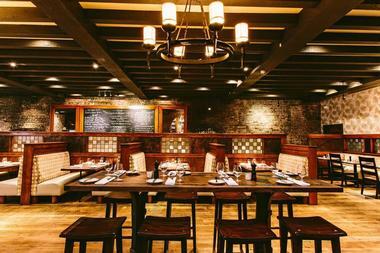 No matter what your taste or style, Charleston has a unique spot for your date night. For mouthwatering burgers and artisan craft beers, Sesame Burgers and Beer is the place to go. The relaxed, family-friendly chain on Spruill Avenue is famous for taking burgers to new heights with a menu of gourmet burgers made with 100% USDA hormone-free prime beef or chicken blanketed in a variety of toppings such as bacon, scallions, fried pickles, queso, chili, and bourbon-jalapeno glaze, to name but a few. The restaurant offers gluten-free, vegetarian and vegan options and uses only the freshest, locally sourced and hormone-free ingredients from regional farms and purveyors. Sesame Burgers and Beer is open for lunch and dinner, seven days a week. Tucked away at the back of East Bay Street, The Gin Joint is a cozy and intimate bar and eatery that serves small plates of light bites and casual fare alongside an impressive list of signature and unusual cocktails, artisan craft beers, and easy-drinking wines. Boasting a 1920s-inspired setting with art deco décor and eclectic furnishings, lively bistro-meets-speakeasy space has a focus on a ‘from-scratch’ mixology approach using locally sourced ingredients like house-made syrup infusions and local herbs. The Gin Joint is open in the evenings, seven days a week. Zero Restaurant + Bar is a hidden gem on the Charleston culinary scene that serves seasonal New American cuisine and handcrafted cocktails in an elegant and refined space. 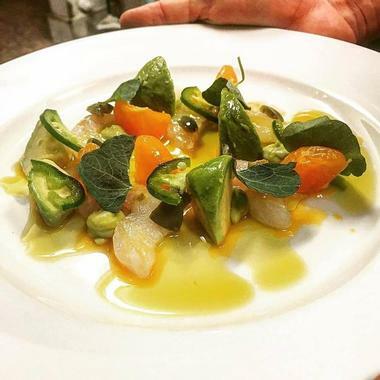 Located within the Zero George Hotel in downtown Charleston, Zero Restaurant + Bar is helmed by Chef Vinson Petrillo who produces a menu of innovative cuisine with a Southern twist. 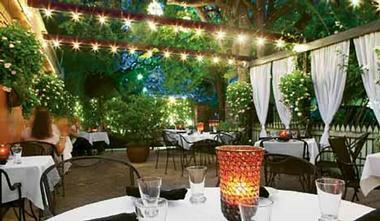 The restaurant boasts a beautiful dining room with elegant décor in the quaint 1804 Carriage House, and a shady courtyard tucked between an old brick wall and breezy piazza for romantic al fresco dining or pre-dinner cocktails. Blending contemporary luxury with the city’s rich heritage and mouthwatering Southern fare, Zero Restaurant + Bar offers a quintessential Charleston experience. Zero Restaurant + Bar is open for dinner only Tuesday through Sunday. Located behind the historic Wentworth Mansion, Circa 1886 offers a fine dining experience inspired by celebrated Southern dishes and global culinary traditions. Exuding classic Charleston charm, Circa 1886 puts a healthy spin on traditional Low Country cuisine with an array of bright, boldly flavored dishes created by Chef Marc Collin and imaginative desserts brought to life by Pastry Chef Scott Lovorn. Signature dishes include appetizers like Carolina crab cake soufflé, entrées such as catfish with lobster and white cheddar grits, or pork belly served with yuzu apple butter and a mouthwatering dessert like and sweet potato butterscotch soufflé. The restaurant offers a monthly three-course prix-fixe menu, and the exceptional cuisine is complemented by an extensive wine list. 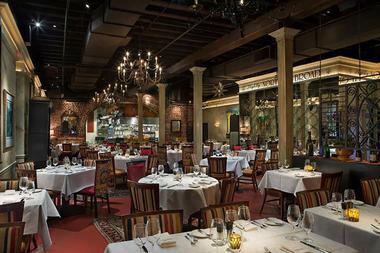 Circa 1886 is open for dinner, Monday through Saturday. For huge juicy portion of smoked briskets, prime ribs, and pulled pork, Lewis Barbeque is the place to go. 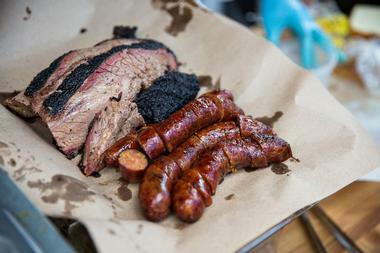 The family-friendly restaurant serves Texas-style house-smoked meats served in an industrial-hip space with outdoor tables and a full-service bar with a menu packed full of meat, meat, and more meat. Think prime beef brisket, pulled pork and pork spare ribs, turkey breast, and Texas “Hot Guts” sandwiches, and a variety of sides, such as cowboy pinto beans, green chili corn, collards, coleslaw, and golden fries. The full-service bar offers an array of artisan craft beers, handcrafted cocktails, boozy agua frescas, and a selection of easy-drinking wines. Lewis Barbeque is open for lunch and dinner, Tuesday through Sunday. Located in the Planters Inn in the heart of the bustling Historic District of Charleston, the Peninsula Grill is a renowned restaurant that serves elevated Southern fare in a spacious, posh setting. South Carolina’s only Relais & Châteaux, the award-winning restaurant features a quiet candlelit garden with illuminated palmetto trees and flickering tea lights that creates a dining oasis in which guests can savor what has been described as “exquisite dining with beautifully choreographed service.” The interior of the restaurant boasts an iconic velvet-lined dining room where seasonal menus of exquisite cuisine prepared with locally sourced ingredients are served. Don’t miss the restaurant’s legendary dessert – the famous 12-layer Peninsula Grill Ultimate Coconut Cake - that has earned worldwide praise. The Peninsula Grill is open for dinner only, Monday through Sunday. The Charleston Grill is an opulent dining destination set in The Shops at Belmond Charleston Place that serves upscale Southern-French fare that is paired with fine wines from around the world. World-class jazz music meets mouth-watering cuisine in this fine dining locale where Chef Michelle Weaver takes local delicacies to innovative new heights. The menu is divided into four sections, namely Field & Pasture, Roots & Stems, Waces & Marsh, and Social & Shared, and feature creative dishes prepared with locally sourced, regional and seasonal ingredients. 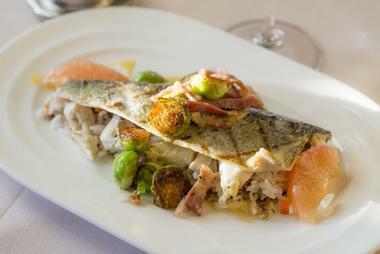 Creations include a grilled peach salad with country ham and candied pecans or seared flounder with buttery grits and shrimp and sherry-country ham gravy. Staff trained in the French tradition offer exceptional service as well as wine pairing suggestions from the restaurant’s extensive wine cellar. The Charleston Grill is open for dinner only, seven days a week. 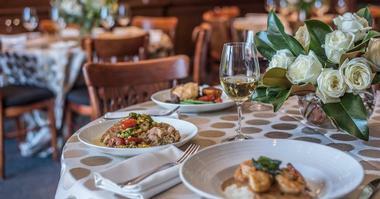 Nestled in the in a quiet corner of downtown Charleston’s Elliotsborough neighborhood, Trattoria Lucca is an acclaimed Italian restaurant that serves traditional, locally sourced Tuscan-inspired cuisine in a comfortable, cozy setting. Inspired by the ancient Tuscan city of Lucca, the family-friendly eatery presents a nightly changing menu that features authentic Italian fare such as plates of antipasti, wood-fired pizza, handmade pasta and sauces, fresh salads, fresh seafood and meat entrées, and mouthwatering desserts. Pasta is made fresh, and only the freshest ingredients are used, many of which are brought back when owner and chef Ken Vedrinski visits Italy, such as olive oils, cheeses, cured meats, and fabulous wines. Bringing the essence of Italian cuisine to the Lowcountry, Trattoria Lucca is open for dinner only, Monday through Saturday. 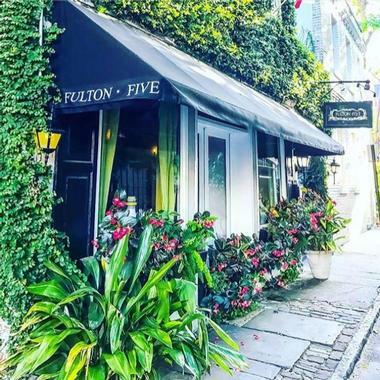 Set in a charming, vine-covered building just a short walk from the bustling King Street, Fulton Five offers an intimate dining experience in a romantic atmosphere. The restaurant’s cozy dining room boasts banquette seating and crisp white tableclothed tables with soft candle-lighting and serves a menu of Northern Italian-inspired cuisine. The seasonal menu features delicious dishes such as ravioli stuffed with braised beef short rib and caramelized onions, salad of lobster, lump crab meat and shrimp, with lemon mayo, tagliatelle Bolognese, seared duck breast and leg confit, grilled bone-in veal chops, and a chocolate espresso-rubbed filet. In the warmer summer months, the upstairs terrace is the perfect place for a romantic al fresco dinner for two. Fulton Five is open for dinner only, Monday through Saturday. 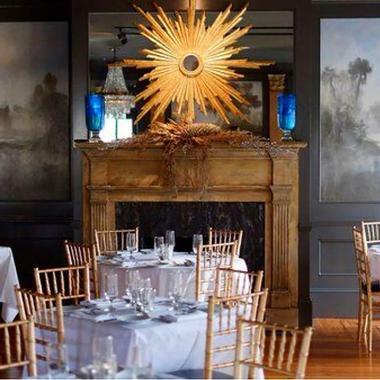 Anson Restaurant is a stylish Southern coastal fixture that is renowned for its innovative cuisine which highlights a thoughtful approach to local ingredients, using the best of what historical Charleston's seasons to create exceptional Southern fare. Boasting a low-key, relaxed ambiance, the 24-year-old restaurant has recently reopened after a fire a few years ago with a brand-new kitchen and a touched-up dining room with gleaming wooden flooring, elegant décor, and soft lighting. The menu strums Southern chords, with dishes like fried green tomatoes, shrimp and grits, crispy boudin fritters, blackened catfish, and crispy flounder, with sweet desserts such as caramel-drizzled pecan tart. Anson Restaurant is open for dinner only, Monday through Saturday. 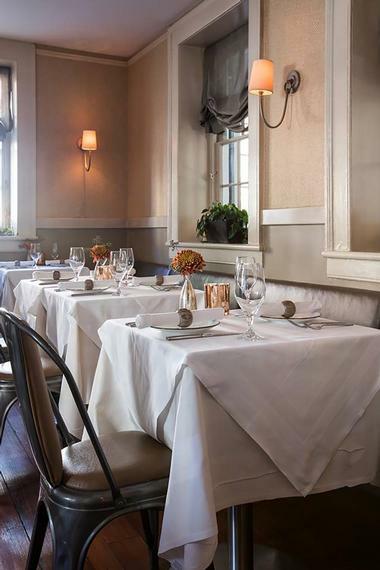 Situated in downtown Charleston’s historic French Quarter at an address that dates back 300 years, 82 Queen is known for its outstanding local cuisine, which it has been serving for the past 34 years, and gracious Southern hospitality. Spread over throughout three buildings with no less than eleven elegant and quiet dining areas, as well as a turn-of-the-century courtyard featuring a magnificent Magnolia tree, 82 Queen has long been a destination for romantic and celebratory dinners. Serving lunch, dinner and weekend brunch, the restaurant serves an array of seasonal Southern fare prepared using locally sourced and artisanal ingredients, with dishes like Barbeque Shrimp and Grits with Applewood smoked bacon, Jambalaya with a medley of local crawfish, shrimp and red rice, and Roasted Duck Pileau with Andouille sausage, black eye peas, and wild rice. A globally-inspired wine list accompanies the outstanding cuisine, along with imported spirits, handcrafted cocktails, and other libations. 82 Queen is open for lunch and dinner, Monday through Sunday. Chez Nous is a pint-sized neighborhood eatery that serves a Euro-centric menu of French-inspired cuisine and wines in a cozy, comfortable space. Located in downtown Charleston, the tiny, convivial restaurant specializes in food and wine from Southern France, Northern Italy and Northern Spain, with an array of Mediterranean dishes like deep-fried squid, beef carpaccio, Greek salad, smoked salmon and avocado stack, an array of wood-fired pizza and handmade pasta with flavorful sauces, and fresh seafood and meat entrées. The restaurant also serves sharing platters of antipasti, along with an impressive list of libations, including globally-inspired wines, craft beers, and signature cocktails. 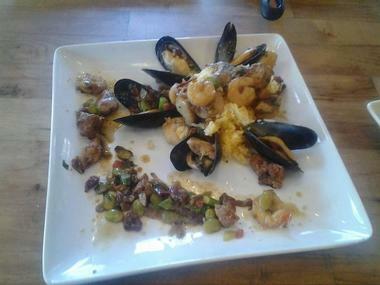 Chez Nous is open for lunch and dinner, Monday through Sunday. Opened in 1990, Magnolias was a forerunner in upscale Southern cuisine, igniting a culinary renaissance in the city that formed the foundation of the food scene today. Offering a refined take on traditional Southern cooking that can be enjoyed in a warm, sophisticated environment, Magnolias serves a menu that reflects the soul of the South with dishes like the Grits and Shellfish of lobster, shrimp, and sea scallops in lobster butter sauce with creamy white grits, and the Down South Egg Roll stuffed with collard greens, chicken, and Tasso ham. Magnolias offer private dining in two elegant dining rooms in the Upper-Level Gallery directly above the restaurant which boasts a separate entrance on historical Lodge Alley and a stylish lounge area ideal for private functions and events. Magnolias is open for lunch and dinner, Monday through Sunday, and brunch on Sunday. Dating back to 1778, when Edward McCrady opened McCrady’s Tavern on East Bay Street to curb his desire for a decent drink, this eponymous watering hole would later become one of Charleston’s finest eateries. 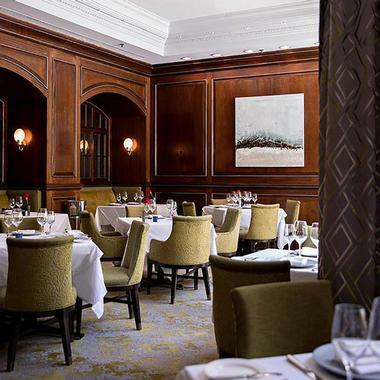 In true Southern form, McCrady’s Restaurant fuses the understated elegance of the dining space with cutting-edge cooking techniques and a unique menu to create the perfect fine dining mix. 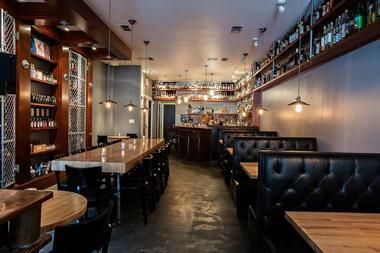 Tucked away on Unity Alley, McCrady’s dining hall echoes the taverns of old with exposed brick walls and Tudor-style beams, while an elegant bar serves handcrafted cocktails and an award-winning wine list. The seasonal menu features daily-changing dishes, made from ingredients sourced from local farmers and stockists, such as local sea scallops, delicate blue crab, fillet of grouper and meat… plenty of meat. The house charcuterie is a must – an amuse-bouche course of five “snacks,” which could include rich duck sausage with apricot, paper-thin shavings of cured local ham on popcorn crisps, blue corn blini with crème fraîche and tiny crystalline Sunburst trout roe. 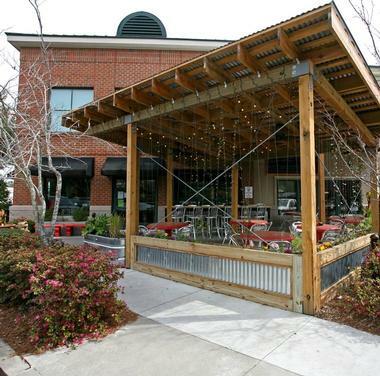 Set in an airy, 18th-century warehouse on E Bay Street, Slightly North of Broad Restaurant (S.N.O.B) is a casual restaurant close to most of the famous attractions in the city that serves modern Southern and Low Country cuisine for lunch and dinner. Boasting wooden floors, tall white columns and beamed ceilings strung with a collection of traditional and whimsical light fixtures, the restaurant serves a creative menu of delectable dishes with distinct Southern accents such as a Jumbo Lump Crab Salad with avocado toast and heirloom tomatoes, the Southern Medley of grilled chicken, eggplant, zucchini, basil pesto, and a balsamic vinaigrette dressing with goat cheese croutons, and desserts like chocolate pot de crème garnished with fresh strawberries. Slightly North of Broad Restaurant (S.N.O.B) is open for lunch and dinner, seven days a week. R. Kitchen prides itself on being a kitchen and not a restaurant. The unique dining establishment features seating for up to 16 guests in the kitchen and 20 on a covered patio, where a seasonal five-course menu is prepared by a select chef and served every night. 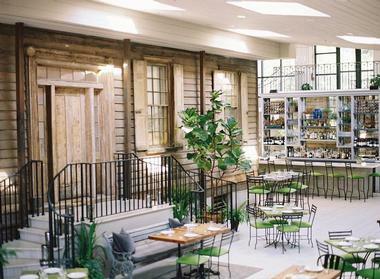 The snug counter-and-kitchen spot packs in a crowd each day of the week to savor the delicious cuisine Chef and owner Ross Web and his small team of assistant chefs create. Taking the needs and tastes of each guest in attendance into consideration, every night a five-course menu is custom-designed, using fresh locally sourced ingredients and regional products. R. Kitchen is open for dinner only, Monday through Saturday and bookings are essential. Minero is a casual Mexican eatery on E Bay Street that serves inventive Mexican cuisine, handcrafted cocktails, and a sizeable tequila menu. Tucked into a space a few doors down from McCrady’s, the hip, the brick-walled eatery is named after the Spanish word for miners, who coined the word “taco” for the hand-rolled explosives used for creating tunnels. Part of The Neighborhood Dining Group, Minero’s menu boasts freshly fried tortilla chips with chunky guacamole; red posole soup served with fried pork skins and a thick tostada, charcoal-blackened chicken wings with a trio of salsas, and a hot queso fundido with chorizo and roasted poblano peppers. 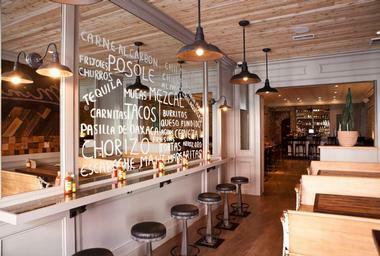 The food can be washed down with a creative collection of cocktails featuring tequila and mescal, such as the El Satanico, and don’t miss the warm cinnamon-and-sugar-dusted churros served with Mexican chocolate ganache. Tucked behind a vine-laden fence on Warren Street in the heart of Charleston, Pane e Vino is an authentic Italian trattoria-style eatery with a small dining room, a delicious menu and a cozy ambiance. Boasting a pretty outdoor patio with hanging planters and flickering candles for alfresco dining, the restaurant serves a menu of classic Italian fare such as big bowls of spaghetti, cioppino, and potato gnocchi, meaty lasagna, fresh mozzarella with tomatoes and olive oil, and fresh seafood plates. The cuisine is accompanied by a selection of easy drinking wines, craft beers, and imported spirits, and don’t miss the decadent desserts, which are perfect for sharing. Pane e Vino is open for dinner only, Monday through Saturday. 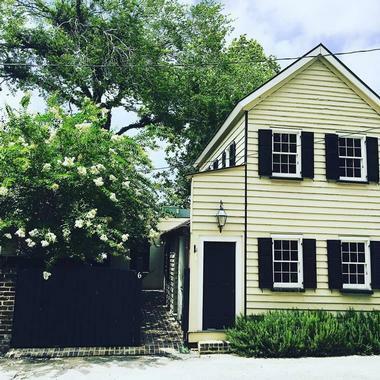 Built around the centuries-old architectural gem of the Single House on 103 Spring Street, Cannon Green offers one of the most distinctive culinary experiences in Charleston. The restaurant features an elegant interior with local artworks adorning the walls and lush greenery and a palm-lined open-air courtyard for alfresco dining in an urban oasis. An ideal spot for happy hour, brunch, a romantic dinner date or a special event, Cannon Green presents a contemporary take on traditional Mediterranean-inspired fare with fresh fish and seafood, including locally harvested Ace Basin oysters, house-cured meats and cheese, fresh salads, and handmade pasta, along with an expertly curated wine selection and other libations. Cannon Green is open for dinner only, Wednesday through Saturday and Sunday brunch.